“Did she say where she intended to go?” Phil Resch asked the stagehand, showing his police identification. And Luba Luft, Rick thought to himself, ends today. 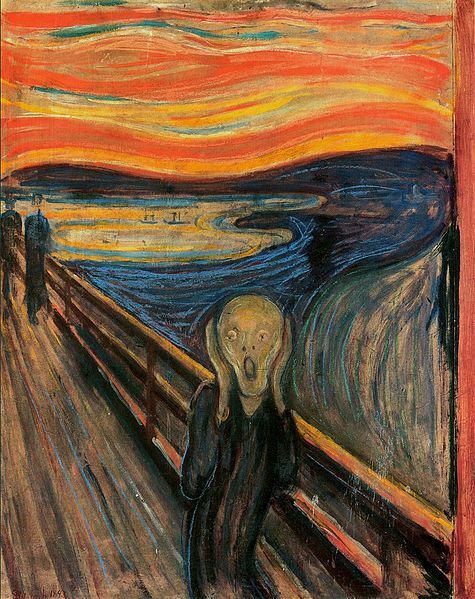 They arrived at the museum building, noted on which floor the Munch exhibit could be found, and ascended. Shortly, they wandered amid paintings and woodcuts. Many people had turned out for the exhibit, including a grammar school class; the shrill voice of the teacher penetrated all the rooms comprising the exhibit, and Rick thought, That’s what you’d expect an andy to sound — and look — like. Instead of like Rachael Rosen and Luba Luft. And — the man beside him. Or rather the thing beside him. “Did you ever hear of an andy having a pet of any sort?” Phil Resch asked him. an inverted pear, its hands clapped in horror to its ears, its mouth open in a vast, soundless scream. Twisted ripples of the creature’s torment, echoes of its cry, flooded out into the air surrounding it; the man or woman, whichever it was, had become contained by its own howl. It had covered its ears against its own sound. The creature stood on a bridge and no one else was present; the creature screamed in isolation. Cut off by — or despite — its outcry. “He did a woodcut of this,” Rick said, reading the card tacked below the painting. “I think,” Phil Resch said, “that this is how an andy must feet.” He traced in the air the convolutions, visible in the picture, of the creature’s cry. “I don’t feel like that, so maybe I’m not an — ” He broke off, as several persons strolled up to inspect the picture. “There’s Luba Luft.” Rick pointed and Phil Resch halted his somber introspection and defense; the two of them walked at a measured pace toward her, taking their time as if nothing confronted them; as always it was vital to preserve the atmosphere of the commonplace. Other humans, having no knowledge of the presence of androids among them, had to be protected at all costs — even that of losing the quarry. “Want me to buy it for you?” Rick said to Luba Luft; he stood beside her, holding laxly onto her upper arm, informing her by his loose grip that he knew he had possession of her — he did not have to strain in an effort to detain her. On the other side of her Phil Resch put his hand on her shoulder and Rick saw the bulge of the laser tube. Phil Resch did not intend to take chances, not after the near miss with Inspector Garland. One of them on each side of her they prodded her in the direction of the museum elevator. Luba Luft did not come willingly, but on the other hand she did not actively resist; seemingly she had become resigned. Rick had seen that before in androids, in crucial situations. The artificial life force animating them seemed to fail if pressed too far . . . at least in some of them. But not all. And it could flare up again furiously. Androids, however, had as he knew an innate desire to remain inconspicuous. In the museum, with so many people roaming around, Luba Luft would tend to do nothing. The real encounter — for her probably the final one — would take place in the car, where no one else could see. Alone, with appalling abruptness, she could shed her inhibitions. He prepared himself — and did not think about Phil Resch. As Resch had said, it would be dealt with at a proper time. After a pause Rick said to the clerk, a heavy-jowled, middle-aged woman with netted gray hair, “Do you have a print of Munch’s Puberty?” “Only in this book of his collected work,” the clerk said, lifting down a handsome glossy volume. “Twenty-five dollars.” “I’ll take it.” He reached for his wallet. Phil Resch said, “My departmental budget could never in a million years be stretched — ” “My own money,” Rick said; he handed the woman the bills and Luba the book. “Now let’s get started down,” he said to her and Phil Resch. “I can’t take this.” Phil Resch dug into his coat, groped. “No,” Rick said; he grabbed at Phil Resch’s hand; Resch retreated, eluding him. “The Boneli test,” Rick said. Phil Resch fired, and at the same instant Luba Luft, in a spasm of frantic hunted fear, twisted and spun away, dropping as she did so. The beam missed its mark but, as Resch lowered it, burrowed a narrow hole, silently, into her stomach. She began to scream; she lay crouched against the wall of the elevator, screaming. Like the picture, Rick thought to himself, and, with his own laser tube, killed her. Luba Luft’s body fell forward, face down, in a heap. It did not even tremble. With his laser tube, Rick systematically burned into blurred ash the book of pictures which he had just a few minutes ago bought Luba. He did the job thoroughly, saying nothing; Phil Resch watched without understanding, his face showing his perplexity. “Do you think androids have souls?” Rick interrupted. Cocking his head on one side, Phil Resch gazed at him in even greater puzzlement.